Shoulder joint replacement, as with other joints mentioned on this site, is performed primarily for end stage degenerative arthritis of the shoulder which is composed of the humeral head (ball of the humerus) and the glenoid (shoulder socket). There are several types of replacement procedures performed and different implants used. They are typically matched to the type and extent of arthritis present in the shoulder, as well as desired functional outcome. The picture at left is an example of the “standard” shoulder joint replacement called the “total shoulder”, where both the humeral head and the glenoid articular surfaces are replaced. This procedure usually involves the insertion of a prosthetic stem into the shaft of the humerus (upper arm bone) and inserting a metal base plate onto the glenoid. 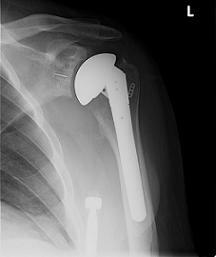 Both the stem and base plate are then fitted with the appropriate interfacing implants; in this case a metallic or ceramic “ball” to replace the humeral head. 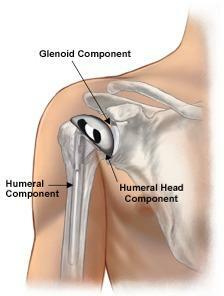 A polyethylene plastic spacer is inserted to provide a socket-type surface on the glenoid to interact with the ball. There are many different sizes and configurations of head implants as well as polyethylene glenoid implants that are matched to the size and shape of the patient’s shoulder anatomy. If arthritis is present in only the humeral head while the glenoid is un-damaged, as is often seen in post traumatic arthritis (from fracture), one may consider performing a partial shoulder joint replacement, or hemi-arthroplasty, replacing only the humeral head. 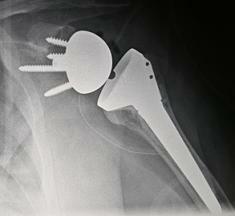 A prosthetic stem is also inserted into the shaft of the humerus and provides a stable attachment for the prosthetic “ball” as seen in the picture below. One of the newest developments in shoulder surgery is called the “reverse shoulder”. It is mainly used in patients who have chronic and severe damage to their rotator cuff tendon complex and there is little-to-no functional cuff material remaining. This prosthesis is based on the principle of providing a construct in the shoulder that is the complete reverse of a traditional joint replacement. Where the glenoid “socket typically resides, the prosthetic “ball is implanted, and where the humeral head usually sits, the corresponding polyethylene plastic spacer/socket/articular surface is attached to the prosthetic stem that is still inserted into the humerus. This replacement type relies on tension of the deltoid (shoulder) muscles and deeper “strap” muscles of the anterior chest, in addition to the prosthetic components, to stabilize the shoulder against dislocation through its range of motion.